I really do spend inordinate amounts of time hanging around any jersey shore jetty. why? because you get this unrestricted, unblocked, unfettered view of the horizon. somehow jersey horizons mean future think. on a clear day you can see forever and maybe europe. the middle east. asia. darfur (sudan) (there’s trouble there again). the united nations is a few miles away in new york. it seems everything happens close to a jersey jetty. washington, dc is just a relatively short boat ride from the belmar marina. on labor day weekend i rested my weary mind on a jetty in deal at phillips beach. “so what beach do you go to these days, calvin?” i hear that all the time. i’m equal opportunity. seven presidents in long branch. avon. belmar 7th avenue near where i was conceived(talk about going home again) and phillips beach in deal. next summer maybe i’ll do exploring. the seagulls i hang around with tell me to head to ocean county. as long as there’s a jetty for me. why a jetty? because it clears the mind. it’s a perfect place for synapses and ganglia. you can think. and think and dream. thinking is an art form. no ipads. cell phones. headphones. or companions. just think. there were a hundred seagulls at phillips beach over labor day. mussel beach (the black shells had washed up). sea shells with clams inside all over too. i watched seagull sociology from my jetty. i thought buffet line at a wedding. when a young teenage seagull found a shell with a real clam, somehow an adult caught a glimpse and attacked the teenager to get the food. the teen bird hopped, skipped and jumped away. what a great olympic event. no wonder why teen birds looked gaunt. the big folks had no shame. i talked to one teen. we related i think. i want to think. i found a large intact closed shell by the jetty rocks with a whole clam inside. i pretended i was tom hanks in the movie ‘castaway’ and cracked open the shell and placed it a few feet away. the teen was fearless and trusted me. i think. the teen feasted on the whole clam. a really big adult approached the buffet to claim a supposed inheritance. i stood and approached the intruder (protecting my new teen friend). the adult backed away after all i am 6′ 5″ and cast a giant shadow. six times it approached and i deterred. my teen friend left satiated without as much as a thank you. i did read recently that animals are much smarter than we give them credit for. i thought about a crow that drops rocks into a container of water to be able to drink(water level raised). larger rocks raise the water level quicker. smart crows. my teen seagull friend should’ve thanked me. then again, i shouldn’t expect anything from gull friends. that was my final thought that day on a noisy jetty. a few teens (human ones) approached eating peanut butter and jelly sandwiches and sat a few boulders away. time to leave my jetty, no longer a place of solitude. time to talk to the people whom i came to the beach with. speaking of teenagers. 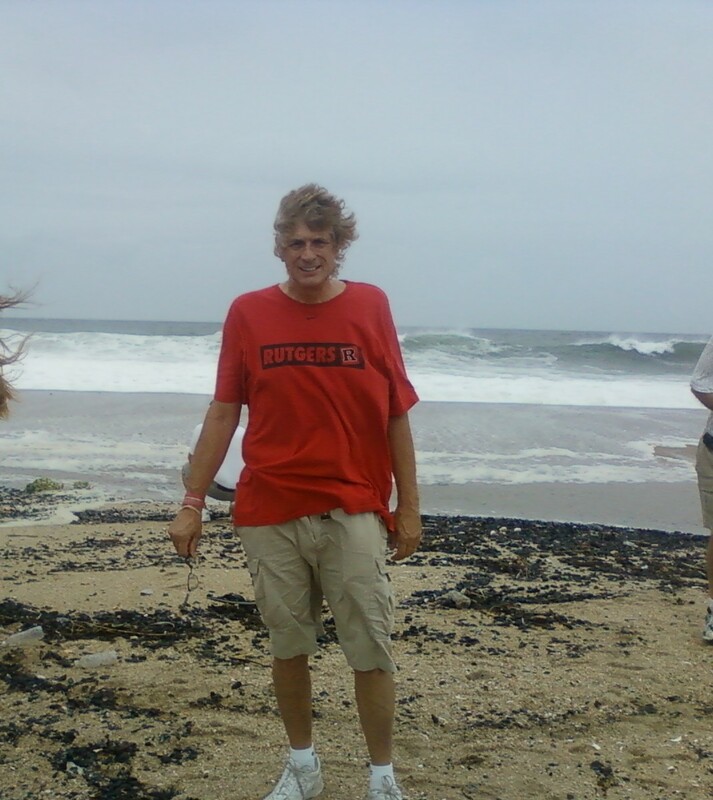 when i was one a while back, i used to go belmar with parents. then all of a sudden you cross the great divide. you’re seventeen and you need to be as far away as possible from parents. generational gap. no more going to the shore with parents until four decades later, you take your parents back to the jersey shore for a day trip. they walk so slow. you have to drop them off by the boardwalk. i learned something recently. folks from pennsylvania used to come to our southern jersey shores when calvin coolidge (no relation) was president and pack lunches in shoe boxes. they were called ‘shoe bees.’ meanwhile, in a carefully thought, deliberated and conceived plan for bridging that generational gap with my almost teenage son, we started going to rutgers football and basketball games together when he was ten. by the time he was a teenager, rutgers stuff was part of our lives and what we did together including travel around the country to away and bowl games. he went to college and i became a beer pong all-american (my age group) and a keg stander (why didn’t my generation think of this? i like keg stands: being suspended in mid-air with beer rushing down your alimentary canal). all part of bridging the generational gap. a conscious effort. works for the most part except when ever i asked him to come to the jersey shore with us this summer. there was always something. he never made it but its ok. there’s always next year. same phrase we’ll hear if the yankees don’t win.